We will begin to compare the two products from the image quality. 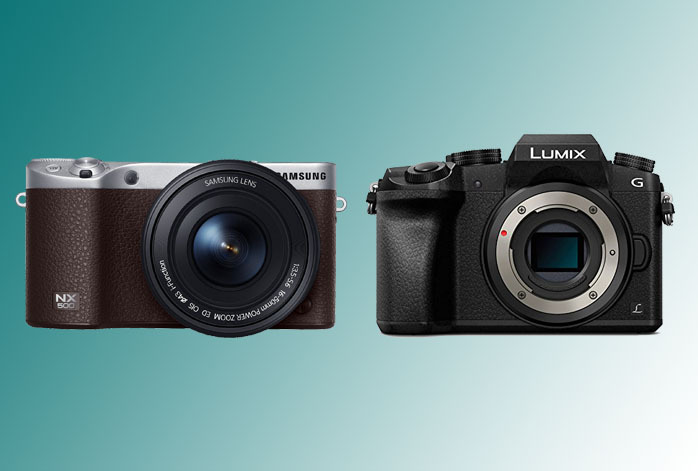 Samsung NX500 is powered by a 28 MP APS-C CMOS sensor, while Panasonic G7 uses a 16 MP micro four thirds system. Also, Samsung NX500 comes with 51,200 maximum ISO, while Panasonic G7 only has 25,600 maximum ISO. As the effect, Samsung NX500 can certainly deliver larger, sharper, and more detailed images than Panasonic G7. With more pixels, Samsung NX500 can generate a more accurate representation of the object you shoot. Also, with a higher ISO, Samsung NX500 can give you a better control over the exposure of the images. Additionally, Samsung NX500 also comes with a higher maximum video resolution than Panasonic G7. Both models claim to record videos in 4K, but only Samsung NX500 that has the true 4K resolution (4096 x 2160). Panasonic G7’s is 3840 x 2160. For sports photography, we usually need a high shutter speed and a high continuous shooting speed. Having a viewfinder is a nice plus. Panasonic G7 comes with a viewfinder and an astonishing maximum shutter speed of 1/16,000s! If you have very good timing, you can make excellent pictures with it. Unfortunately, it only has a continuous shooting speed of 7 fps, and a small buffer capacity. It can only take 6 RAW shots or 38 JPEG shots before taking a break. On the other hand, Samsung NX500 only has a maximum shutter speed of 1/6,000s, which is pretty great already, but comes with 9 fps photo burst and a significantly larger buffer capacity. It can take up to 16 RAW shots or 240 JPEG shots before taking a break. For sure, Samsung NX500 is more reliable for long sessions. In the end, we would like to recommend you to choose Samsung NX500. Though some of its features are not as great as Panasonic G7’s, it can give you a more reliable performance and better versatility.